This is another infant resource which I recently received. It covers literally every aspect of teaching children how to read, from phonemic awareness, to phonics, from fluency to vocabulary and comprehension, it’s all here. It is an extremely detailed resource, for example phonemic awareness one covers phonemic isolation, identity, categorisation, blending, segmentation, deletion, addition and substitution. I t also offers a wonderful phonemic awareness assessment which will help you to identify immediately if you have a child who is struggling with this area. The resource offers segmented word cards for CVC words. 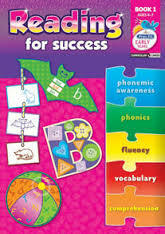 Reading for Success offers the teacher a number of fun activities for phonic games, with templates provided. It also provides templates for games based on initial sounds and ending sounds. It progresses then to medial sounds, including short to long vowels with many activity sheets on long and short vowels. These in particular would be a brilliant form of revision come the end of the year. I know most junior and senior infant teachers use Jolly Phonics or Letterland. There aren’t a huge amount of resources available in my opinion for teaching reading, but this resource booklet has everything you need for hands on reading activities. As reading is so technical, I know many NQT’s may be unsure of where to even begin with it, from phonemes to phonics etc, but this resource explains everything in a nutshell! Then the lovely word families-there is a really fun activity called ‘Spin the Word’ for these! The book moves on then to reading aloud. It gives many examples of songs and poems to start children off with as they first encounter reading aloud. It explains the whole process to the teacher, from pupil adult reading, to echo reading, choral reading, partner reading, songs and group divisions. Best of all, this book contains templates for the children to create their own book! This would be a big hit in the classroom. It also has a section on readers theatre, which would be so much fun! It has some lovely themes, such as community helpers. The finals section of the book deals with teaching vocabulary and comprehension, it suggests a variety of ways, as you can choose which way suits your class best. It contains a number of simple comprehension pieces at the back of the book which would be a perfect way os assessing your class’s comprehension skills throughout the year.